Support your favorite climbing plants with a French flair using these Achla Black Fleur-De-Lis Topiary Frames. These four, generous supports bring both style and strength to your garden, with their black color, fleur-de-lis finials, and long legs. 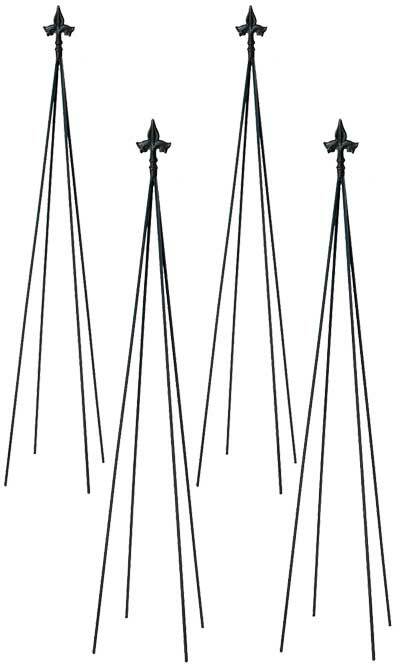 Four wrought iron legs on each unit all extend downward from the top finial, and may be spread outward easily to fit around a particular plant or in a pot. This versatility allows you to alter the height of each piece, and their black, powder coated finish remains beautiful indoors or outside. The wrought iron construction easily supports runner beans, honeysuckle, or ivy, and the set of four makes a great garden focal point. Add dramatic support to your favorite crops or flowers with these Black Fleur-De-Lis Topiary Frames. Note: This case pack includes 4 of the Achla Fleur-De-Lis Topiary Frames, Black, 78".